Our plant production units combine the latest technologies with elaborate craft and engineering techniques for Gülaylar products. Gülaylar plant engineers and employees, in order to maintain high quality and uninterrupted production, oversee all the phases of the process from the finalization of the product to its delivery. Our college graduate engineers and production personnel, being experts in their domains, can meet the expectations of our international customers and the local needs of various countries. 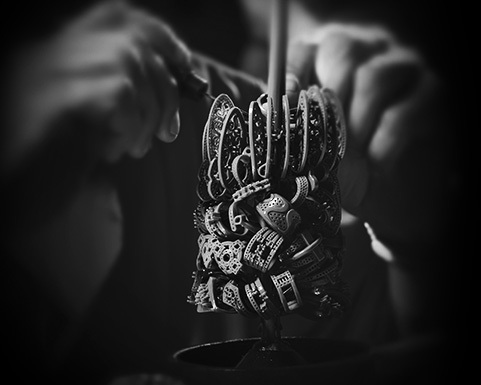 Our plant applies the world standards of “cost and high quality” controls and is one of the best in the jewelry sector in terms of its adherence to such rules. Through the R&D department we are able to design and manufacture high quality 8,9,10,14,18,21,22 karat collections that are sold with the most appropriate prices to both our domestic and international Gülaylar customers. The products, designed and prepared by R&D, enter the prototype mould production process when they reach the plant. With the know-how unit the technical production specifications are determined. After that the products are moved to serial production phase, during which the products’ production with the highest quality and the lowest possible price is supervised and guaranteed by the Gülaylar plant administration. With the R&D units’ dense logistic support, the Gülaylar Group continually renews its production technology, and with the training it provides for sub-provisional chains the group manages to reach all intended quality standards. international "Gülaylar" offers to its customers.